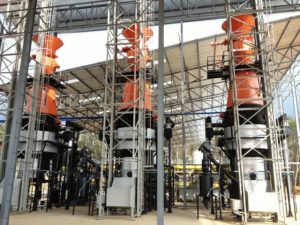 WBP series of Power/CHP plants are designed for operation on wood chips and wood/agro biomass briquettes. Consistent biomass fuel quality is one of the most critical requirements for a stable operation of a WBP gasification Power/CHP plant, yet is often difficult to achieve in practice and energy intensive where biomass feedstock drying is involved. The optimum biomass fuel for a WBG gasifier is coarse uniform wood chips 40-70mm long and 10-25mm thick, some agricultural wastes, or high density round briquettes. The briquettes must be 50-70mm long and 35-80mm in diameter and made from any biomass with moisture not more 14%, ash content not more 5%, and ash fusion temperature not less 1,150°C. We offer special Briquette Lines for making briquettes strong enough to stay compacted during gasification. The briquetting systems have been tested with the WBG gasifiers we supply to ensure compatibility and smooth operation. You can see examples of biomass feedstock tested and approved for gasification in WBG gasifiers in Table 1 on Gasifier systems page.